I saw this shirt in my closet and realized that I have not worn it in awhile. I have not worn plaid in quite some time, so it was a nice change. Hope everyone had a good weekend! Went by way too fast! Thanks Katherine! 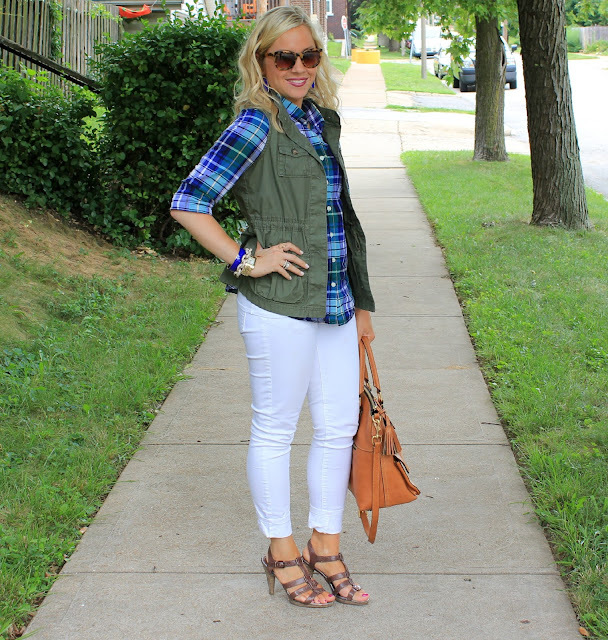 Found this vest last fall at Old Navy! Love the vest and the plaid! I also love that you paired them with WHITE jeans! I would have never thought of that. LOVE it girl! Thanks Dani! I usually think of plaid for fall/winter, but this color plaid and white makes me think summer! 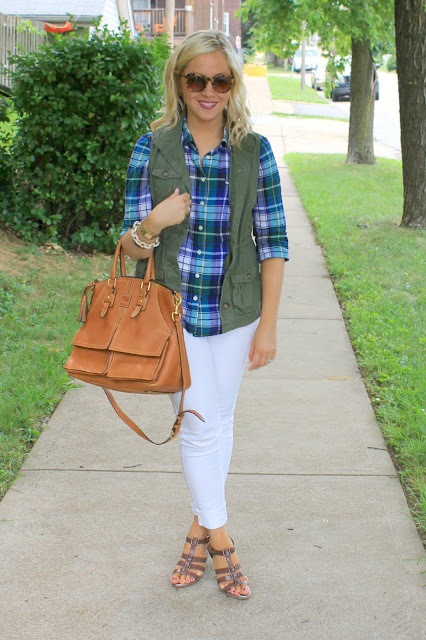 I love the vest and plaid layering, so cute! I need to get myself a cargo vest for the fall! Thanks Sharon! This vest is so fun! I love the plaid top...the colors are so pretty. And it is perfect with the vest! Thanks Debbie! Love this color blue! Love it! The plaid looks fabulous with the vest. And I love that bag! Back school always means plaid right?? Thanks Brett! I always think of plaid with back to school too! LOVE the vest, I have a similar one that I've been wearing a TON! Thanks! 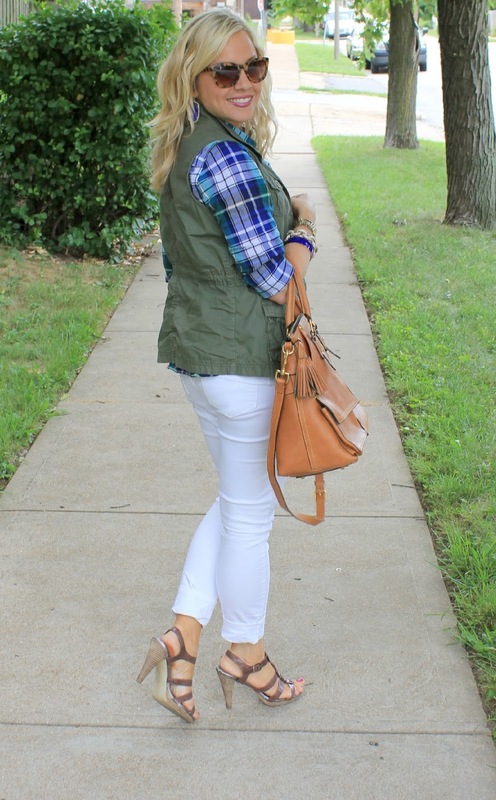 Love this style vest! You can wear it so many ways! I love to wear plaids. Such a cute shirt. 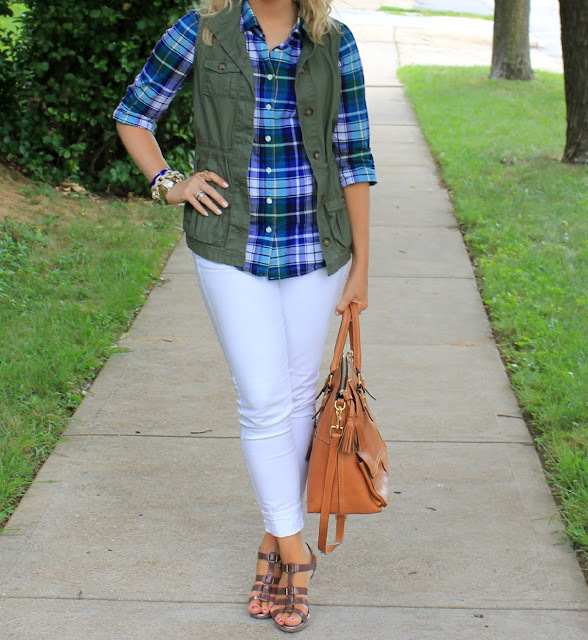 I love the vest with this plaid shirt! I may have to incorporate this into one of my looks since I struggle with ways to wear my vest! Thanks Bethany! 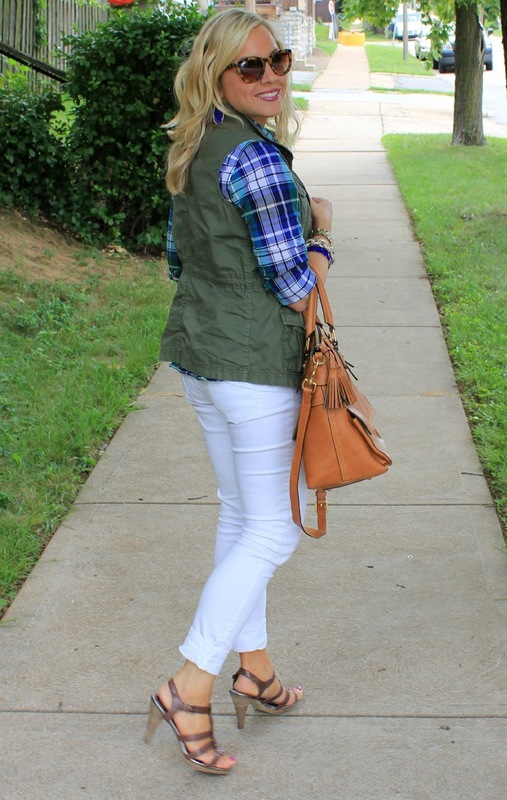 Love adding plaid to a vest! Love this outfit. THe plaid with the vest is fabulous. I have been searching for a vest like this forever. I'm hoping Old Navy gets them back again for Fall. Great look. I honestly think we have the same closets...and I'm really not kidding. Anyways, I love this outfit! 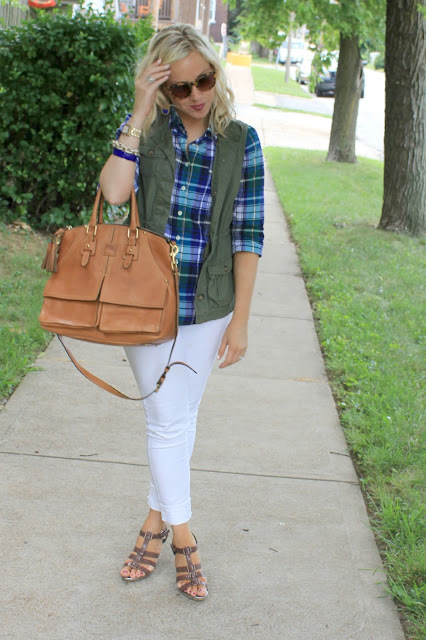 The plaid makes me wishing for fall! You know what they say! "Great minds think alike." I just bought another plaid shirt this past weekend! Ready for fall! That satchel is everything. Its my favorite color for shoes/bags. Might have to give myself an early Christmas present.